The LG G6 might not be a 4K phone but it will be the first phone to get Dolby Vision. Revealed at MWC 2017, LG has teamed up with Dolby to offer the HDR technology, although it is still unclear whether the LG G6's hardware has been built to support Dolby Vision or if the phone will be using the recently revealed software version of the HDR format. For some time, Dolby Vision has been something that's only been available on a limited number of devices, because it would require a bunch of hardware smarts to get the technology to work. But this has changed, with Dolby announcing to Forbes that there's now a way to get Dolby Vision through a software update. 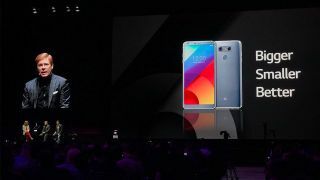 The LG G6, LG's flagship phone, has a 5.7-inch screen. It's not 4K but with the addition of HDR, it should be a great device to watch movies on. Both Amazon and Netflix have announced that they will be the first to support Dolby Vision content, so there should also be plenty of stuff to watch on the G6 that's HDR compatible.